In small bowl, mix ranch dressing, sour cream and 1 teaspoon of the taco seasoning mix; stir to completely blend. Cover and refrigerate until ready to serve. Brush chicken with oil; coat with remaining taco seasoning mix (from package). Place chicken on grill over medium heat; cover grill. Cook 15 to 18 minutes, turning once, until juice of chicken is clear when center of thickest part is cut (at least 165°F). Cool completely in refrigerator (about 20 minutes); chop into bite-size pieces. 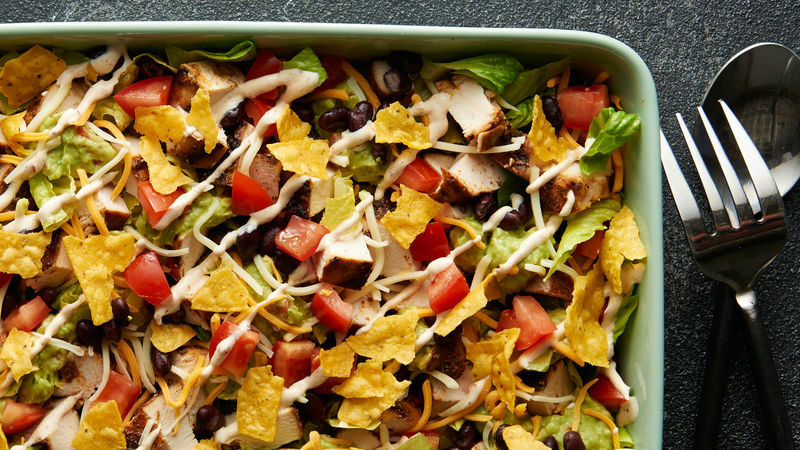 In ungreased 13x9-inch (3-quart) glass baking dish, layer lettuce, chicken, guacamole, cheese, beans and tomato. Cover and refrigerate until ready to serve. Just before serving, drizzle with dressing, and top with crushed tortilla chips. If chicken is browning too quickly, lower heat and grill until internal temperature is reached. Want more toppings? Top with sliced olives, jalapeños or green onions.